So as you may or may not know, I've gone back and forth as to whether to continue my blog and for now, the best decision for my family is to go on a hiatus! I LOVE to coupon and with my little ones getting a little bigger and forgoing naps, I don't have the time it takes for both couponing and blogging. I have enjoyed blogging (for over 2 years now) and may get back into it when my little ones are a bit older, but for now, I'm going to enjoy my little ones while they're still little! So here are a few blogs that I frequent and I'm sure you will too! As always, it's truly amazing what you can save with a little time and effort. Happy Couponing and thanks for tuning in!! I owe a huge "Thank You" to my hubby who helped me out so much with the blog! When he got home from work, he would watch our little ones while I would catch up on blogging and everything else!! I love him so much! Not only is he a great hubby but an awesome dad! Here are a few pics you may enjoy! My son and hubby at the dirt bike show...see the ear plugs in my son's ears? haha...he looks like Shrek! New Meijer mperks $10 off $50 ecoupon! Check your mPerks account! It looks like they've added a $10 off your total purchase of $50 or more valid tomorrow, Thursday, February 24 only!! 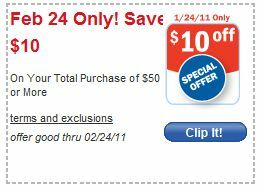 I don't know if you've put off running to Meijer, but in the past the $10 comes off despite the coupons that you use...so combine the above deal with coupons for an AWESOME deal! If you head over to Pei Wei’s Facebook page you can print coupon for a free order of their new Korean BBQ with the purchase of another entree! Don't miss a deal, subscribe to the FREE daily email! 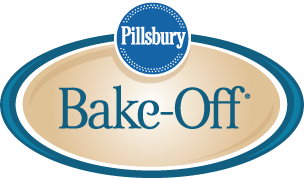 If you have an original recipe that’s suitable for the Pillsbury Bake-Off did you know it could win you a million dollars? One of the finalists last year made cookies...so it doesn't need to be a difficult recipe. Submit your original recipe and if you win the million, you have to come back and let us know! This code expires Feb. 26, 2011. Here are a few great Yoplait coupons you'll want to print! So if you're looking to grab some breakfast for lunch, then grab a friend and head to Mimi's Cafe! Today and tomorrow use this coupon and when you buy any breakfast item you'll get one FREE up to a $9 value! !